Are you a teacher, administrator, school counselor, therapist or other education professional interested how simple yoga and mindfulness techniques could help you create a more peaceful, productive classroom day? 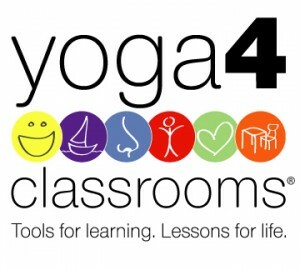 Yoga 4 Classrooms® is an evidence-based, low-cost, simple, effective and sustainable tool designed for classrooms, which facilitates students’ physical, mental, emotional and social personal growth. Y4C is anchored in well-validated evidence-based classroom pedagogies, developmental science, cross-sectional research in cognitive affective neuroscience, tenets of positive psychology and secular contemplative practices. 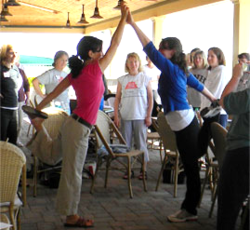 The Yoga 4 Classrooms® Professional Development Workshop is a full day workshop that covers 67 yoga and mindfulness-based activities you can put to use in your classroom immediately. Y4C includes a mix of yoga postures, brain boosting movements, breath exercises, visualizations, mindfulness activities, creative movement and community-building games. The Y4C curriculum is focused on social, emotional, and attentional self-regulating strategies and skills, grounded in mindfulness and yogic practices and developed to systematically cultivate well-being, resilience and lifelong learning. School children practice balloon breath with a Yoga 4 Classrooms trainer. Yoga 4 Classrooms activities are divided into six categories: Let’s Breathe, At Your Desk, Stand Strong, Loosen Up, Imagination Vacation, and Be Well. Each activity includes illustrated instructions, discussion points, sub-activities, and educational tie-ins, for a total of more than 200 beneficial classroom practices. The activities were specially chosen for their suitability for the typical classroom space and schedule and can be implemented in a variety of contexts. All activities can be done standing beside or sitting at desks, while bodies remain off the floor, away from dirt, germs and chemicals. Though there are many worthy children’s yoga programs, none are entirely suitable for the classroom environment and/or there is too much emphasis on yoga stretching and too little on addressing the whole child: social, emotional and physical. Y4C was developed to fill in the gaps, and simply and practically address the needs communicated by teachers, administrators and parents. Learn more about how the Yoga 4 Classrooms workshop addresses the educators’ and students’ needs. The Yoga 4 Classrooms® Professional Development Workshop is the first step in learning about the Y4C program, its components and curriculum. Absolutely no yoga experience is required. This fun and informative workshop will relax and inspire you! *Participants will receive a link to the materials download at least 48 hours prior to the workshop. It is not necessary to print the materials though you may wish to print and bring along the Note-Taking Guide if you plan to take notes. If you already have a copy of the Yoga 4 Classrooms Card Deck, please bring it along to the workshop. Otherwise, you can purchase a deck through Amazon.com or order a copy from Breathing Space to be picked up at the workshop. Learn more about other On Location and Online options. *Participants who train with Jennifer Mueller are eligible for continuing education credit through the OSSE Office of Early Childhood Education. If participants wish to seek credit from other credentialing agencies and need more than their certificate of completion for documentation, CEUs can be requested from UDC for a modest fee.